Remember this adorable photo of the deer in my backyard from last year? Well, I'm rethinking my affection for the wide-eyed innocent looking creatures who visit me so often. Half my green beans were munched the other day and look what they did to my hostas! Now, I'm willing to share, but did they have to take the whole barrel full? Whoa! 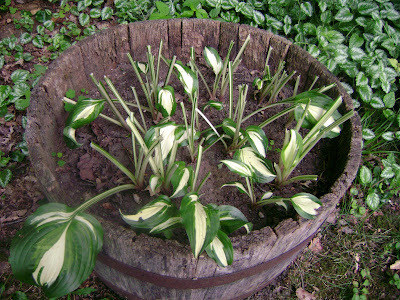 who'd a thought they'd like hostas! Try Sriracha hot sauce on the hostas. The deer would probably like it more than the hostas would, Dave! 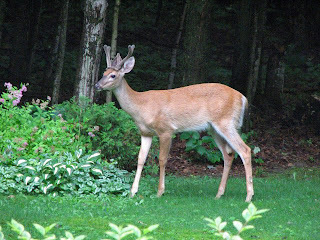 So now we know the truth about Bambi; he's hostile to hostas and a coward too; he's obviously eating lilies for his liver.